Greenwich, CT - “Hello my friend” it reads at the entranceway of Tony’s, the new Italian Steakhouse and Bar located in the stunning J House boutique hotel and gathering place in Greenwich, Connecticut. The greeting is genuine and the man behind the sentiment is veteran restaurant Maître d’ and trivia whiz Tony Capasso – a Greenwich “institution” some might say. Tony’s is named after and operated by this true talent, at long last, a place he can call his own. Capasso first made his mark within the Greenwich fine dining scene while hosting many a guest at the popular Valbella!! a true see-and-be-seen locale for high-powered execs, sports & entertainment personalities and locals. A consummate professional with a knack for keeping things light and welcoming, Capasso was always quick with trivia challenges for the table, all the while taking command of an active dining room and his staff. In 2010, after 18 years at Valbella! !, Capasso went on to open the stylish Gabriele’s Italian Steakhouse, where he took on the role of managing partner. Loyal customers followed and soon a whole new clientele emerged as this charming restaurateur continued to welcome guests into his dining room. Joining Capasso is Executive Chef Daniel Radovic. Prior to joining Tony’s new endeavor, Radovic served as Executive Chef of Gabriele’s Italian Steakhouse, where he combined old school Italian fare with new school steakhouse favorites. Tony’s menu is an exciting and comforting fusion of elbows-on-the-table dishes such as The Big Meatball made with pork, veal, beef, Parmigiano Reggiano, ricotta, and tomato basil sauce; Fritto Misto of lightly dusted and fried rock shrimp, calamari, zucchini chips, and zesty long hot peppers; and decadent Short Rib Arancini, rice balls stuffed with braised short rib, porcini mushroom, and finished with a garlic cream sauce. A lavish icy raw bar display is brimming with New England clams and oysters, jumbo shrimp, lobster, and seasonal crustaceans. Steaks are dry-aged in-house and on full display. Steakhouse favorites run the gamut from filet and t-bone to the dramatic long bone ribeye and porterhouse for two. Classic and not-so-classic side dishes include charred broccoli, truffle fries, and creamed spinach. Radovic impresses with a mouthwatering Tagliatelli Truffle dish laced with black truffle, cream, truffle romano cheese, topped with a lobster tail, and his Spaghetti Carbonara is simplicity at its best, sautéed with pancetta, peas, shallots, and creamy egg yolks. Market fresh fish preparations change often and currently features a Chilean Sea Bass served with parsnip puree and finished with a porcini and leek cream sauce. The beverage program at Tony’s is just as thoughtful and inviting as the menu. A global wine list with a strong nod to Italian varietals delights, as does the craft beer selections, handcrafted cocktails, and premium spirits. In keeping with the J House hotel’s eclectic design aesthetic, Tony’s dining room is reminiscent of a 1940’s supper club, romantic at first glance, with unabashed drama at its core. Warm earth tones, plush seating, trees aglow, and persimmon shaded chandeliers fill the room. The white marble-top bar lined with leather high-back seating looks over the wood-burning open hearth. 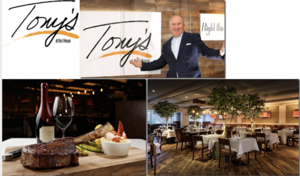 In the warmer months, Tony’s is unlike anything that exists in the region, with a design layout that brings the indoors outside. The open-air dining and bar areas are protected from the weather by a clever system of trellises and heating units that allow the outdoor spaces to be used for much of the year. The property is adorned with lush gardens, a resort style pool with cabana setting, and a beauty spa. The hotel boasts 86 high-tech guest rooms, plus a stately Presidential Suite. Private events can be accommodated in the hotels’ banquet suites, the wine room, the board room, and the beautiful outdoor garden. Tony’s is open 7 days. Breakfast, lunch, dinner, cocktails, weekend brunch.